Bone loss begins soon after a tooth is removed and in the case of upper molars progresses rapidly such that in less than a year a bone graft will likely be needed. If your upper jaw lacks bone depth in the sinus area then surgery will be required. A temporary opening is made in the roof of your mouth to place bone grafting material beneath the floor of the sinus and extend the bone depth in your upper jaw. Implants can be placed at this time, but they will not be able to bear any load until sufficient healing has taken place to prevent them working loose. Your oral surgeon will cut the gum tissue where your back teeth were, and raise the tissue to expose the bone. A small window is opened in the bone so the membrane lining the sinus on the other side of the window can be gently separated from your jaw. Granules of bone graft material are packed into the resulting space until enough bone has been added above the jaw. With this bone in place, the gum tissue is closed and stitched. Though your implants will be placed at this time, it will take several months for the graft material to mesh with your bone and the implant. Your implantologist will want to see you again to evaluate the results about a week later, to make sure the area is healing properly. After the procedure, you will have some swelling and may experience some bleeding from your mouth or nose. You must avoid blowing your nose or sneezing forcefully which could cause the graft material to move. If necessary use antihistamines to help prevent this. You will be given prescriptions for pain medication and for antibiotics to help prevent infection. Most patients have only minor discomfort for a few days after a sinus lift, and recover quickly, within a day or two. You must avoid brushing in the immediate area until it has healed, and use the softest possible brush in the mean time. After the first day, using salt water rinses will aid healing and help with cleaning. Following a sinus lift, you need to wait several months for the bony material to harden and integrate with your jaw and implant(s). The main risk of a sinus lift is that the sinus membrane could be punctured or torn. If the membrane is torn during the procedure, the surgeon will either stitch the sinus tear or place a patch over it. Infection is a risk of any surgical procedure. However, this rarely occurs after sinus lifts. On rare occasions, the existing bone does not integrate with the graft material, and the grafted area does not develop a blood supply. If this happens, any implants placed in this area will fail because there is no live bone for them to attach to. If this happens, you can have the sinus lift procedure repeated. 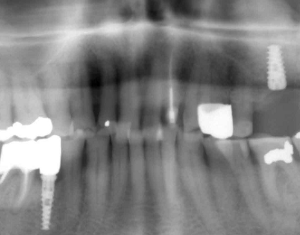 In the the following xray you can see that a sinus lift has been done so there is plenty of bone to support the implant showing in the top right. See this page for more information on xrays and computed tomography scans, and to see the condition before the sinus lift. Another implant is showing in the lower left jaw, and a root canal was done next to it. A bicuspid (premolar) on the right which was in need of repair has been given a permanent crown. The lower left implant and the molar with the root canal have posts installed, and there are crowns on these posts. The implant for the molar in the upper right does not have a post yet. The bone grafting must heal and the implant must bond firmly to the new bone before it can safely bear the load of chewing. When it is ready, permanent posts and crowns will be added on a final visit to complete the work. This patient will be leaving the clinic with functional teeth for chewing, repairs completed, and no gaps apart from the sinus area. Other teeth can be used for chewing until, a few months from now, a crown will be installed where the sinus lift was done. When completed, this work will be of the highest standard and good for many years to come.